MWN Blog: Weather 102: Why is our cloud cover staying in place so long? Weather 102: Why is our cloud cover staying in place so long? Thought I'd do a quick explainer on why it was cloudy all day today after forecasts yesterday indicated we might see some afternoon sun, and why I think we could have a repeat for most of tomorrow. 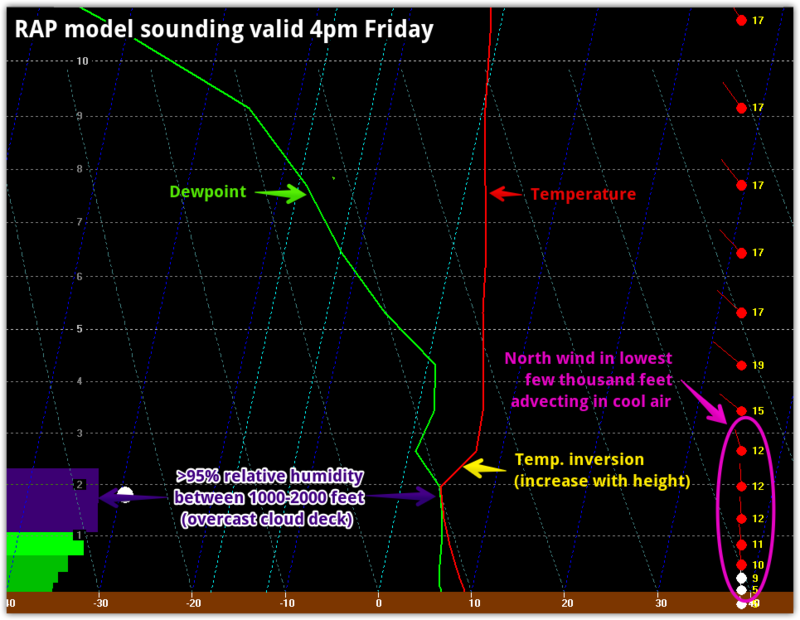 A forecast sounding is basically a cross-section of the atmosphere from top to bottom over a certain location. The high-resolution Rapid Refresh (RAP) model sounding valid at 4pm Friday (below) is very similar to what the atmosphere has looked like today and will continue to look like through most of tomorrow. A layer of high moisture content air (greater than 95% relative humidity) exists in the lowest couple thousand feet above the ground. This moisture is "trapped" below a temperature inversion, meaning temperature increases with height above it. 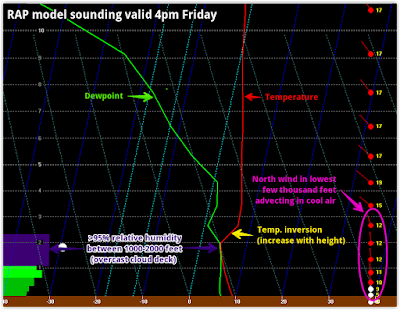 That inversion effectively places a "lid" on the air below it as increasing temperatures with height create sinking air. Cool air from the north is advecting, or moving, in below the inversion, keeping it cool in the lowest couple thousand feet. If you were to fly out of Memphis today or tomorrow, about 60 seconds after take off, you would be above the clouds and it would be sunny - they're not very thick! Until the low level air can warm up, breaking the inversion, or the moisture can diminish due to drier air moving in, the clouds remain in place. On Friday night, and to a greater extent on Saturday, we will see the low level wind increase and much drier air arrive in the low levels, allowing the clouds to break up and resulting in a mostly sunny day for Saturday as high pressure builds overhead. 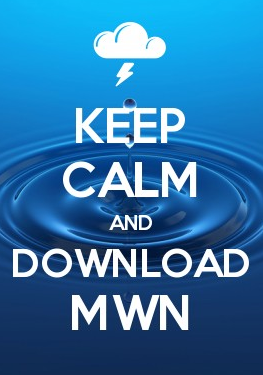 Check out latest forecast via the MWN mobile app. Looking ahead, we'll be watching the Monday-Tuesday timeframe very carefully. Longe range global models are still in disagreement on the details, but it appears that the next major weather system will move through the Mid-South. Heavy rain (potentially a couple inches) and possible severe weather are both in the cards sometime between Monday afternoon and Tuesday afternoon as low pressure moves very close, if not through, the Mid-South and the atmospheric wind field really cranks up. Check in throughout the weekend for updates on our social media feeds. Last Friday's storm served as a wake up call that we are in the midst of secondary severe weather season. After a relatively boring few months, the pattern has definitely shifted to "more active" mode! Hope everyone had a great Thanksgiving! We are grateful to all of you for your support throughout the year and wish you all a great holiday season!